To learn even more about macarons, read Serious Eats: “Introduction to French Macarons”. 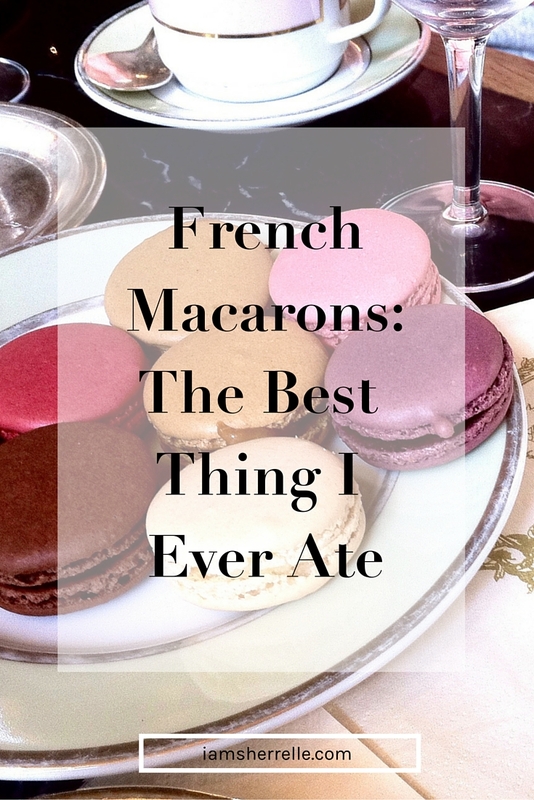 We had our first macaron right down the street from our apartment at Maison Georges Larnicol on rue de Rivoli and after one bite we vowed to have as many as possible while in Paris. They are insanely delicious! Delicate, yet bursting with flavor, each bite is heavenly. I don’t know how they pack all that flavor into such a little tiny cookie! At Maison Georges Larnicol we had Caramel, Citron (lemon), Bergamot, Pamplemousse (grapefruit) and our favorite at this location, Rose. Our next macaron tasting was at Le Grand Epicerie Bon Marche, an incredible “grocery store” on the ground floor of the high-end department store Le Bon Marche. We ate macarons of Framboise (raspberry), Chocolat, Caramel á la Fleur de Sel (salted caramel) and Pêche (peach). Our favorite macarons from Le Grand Epicerie Bon Marche were Pêche and Framboise, although all were very good. Our 3rd macaron experience was at Angelina. Since we were there to drink Angelina’s famous hot chocolate, we only had one macaron on the way out, Manderine Passion. Tropical and fruity, this macaron was different and delicious! We regret not buying more macarons to eat later. Finally we had macarons at the legendary Ladurée. This was on my “must eat” list and after my first macaron at Maison Georges Larnicol, I really wanted to see if Ladurée’s macarons lived up to the hype. 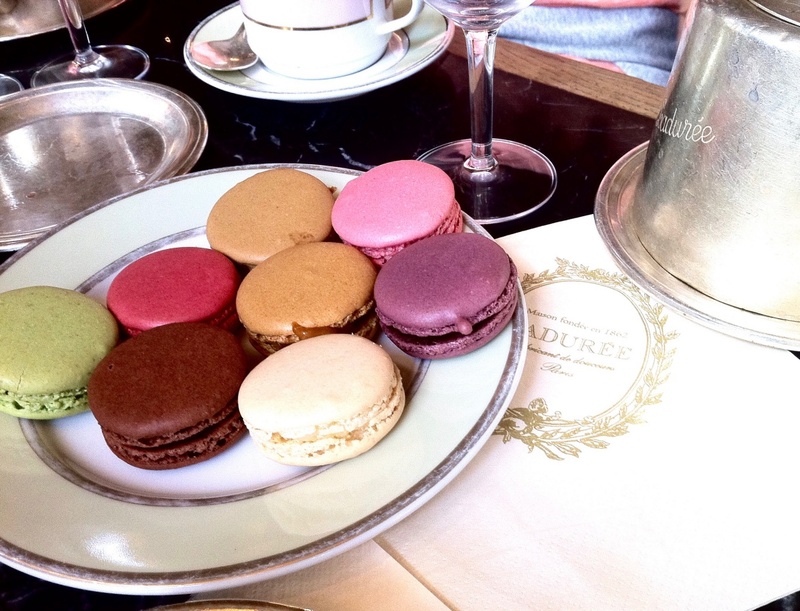 Ladurée’s macarons were the most expensive ones we tried, but they were worth every euro. They are incredible! You can buy them at the shop or have them with a pot of tea in the tea salon next door. We did both. The tea was delicious and the salon is beautiful. Ladurée’s macarons can be packaged to make nice gifts, however it is best to buy gifts at the airport location because macarons must be eaten within 3 days. We went crazy at Ladurée and tried several flavors: Pistache (pistachio), Chocolat, Cassis Violette (black currant violet), Citron-Thym, Vanille, Coco (coconut), Framboise (raspberry), Café, Caramel á la Fleur de Sel (salted caramel), Pétales de Rose, Melon, Goyave (guava) and Fleur d’ Oranger (orange blossom). Honestly all the flavors were delicious, but the stand out was Caramel á la Fleur de Sel; it had the perfect mixture of sweet and salty and melted in my mouth. Mmmmm….it was divine! It’s a good thing that French macarons are not available near me because I would have a problem! *Read about the rest of our Paris vacation and London adventures too! I have been so very curious about the macaron. They seem to be all the rage these days but yet I’ve never tried one. Your experience tasting your way around Paris with all different flavors of them makes me more than a little jealous. If I’m being honest. I would go back to France just to eat macarons! Although I read that they are opening a Ladurée in New York City soon–and that’s much closer.